This additional paid in capital template demonstrates the calculation of additional amount of capital paid by investors. 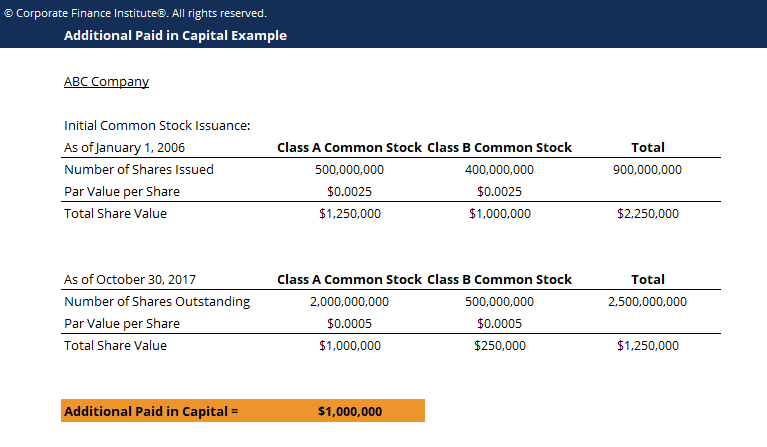 Additional Paid In Capital (APIC)Additional Paid In CapitalAdditional Paid In Capital (APIC) is the value of share capital above its stated par value and is listed under Shareholders' Equity on the balance sheet. APIC can be created whenever a company issues new shares and can be reduced when a company repurchases its shares. APIC is also commonly referred to as Contributed Surplus. is the value of share capital above its stated par valuePar ValuePar Value is the nominal or face value of a bond, or stock, or coupon as indicated on a bond or stock certificate. It is a static value determined at the time of issuance and unlike market value, it doesn’t fluctuate on a regular basis. and is an accounting item under Shareholders’ EquityStockholders EquityStockholders Equity (also known as Shareholders Equity) is an account on a company's balance sheet that consists of share capital plus retained earnings. It also represents the residual value of assets minus liabilities. By rearranging the original accounting equation, we get Stockholders Equity = Assets – Liabilities on the balance sheetBalance SheetThe balance sheet is one of the three fundamental financial statements. These statements are key to both financial modeling and accounting. The balance sheet displays the company’s total assets, and how these assets are financed, through either debt or equity. Assets = Liabilities + Equity. APIC can be created whenever a company issues new shares and can be reduced when a company repurchases its shares. APIC is also commonly referred to as Contributed SurplusContributed SurplusContributed Surplus is an account of the equity section of the balance sheet that holds any excess amounts made from the issuance of shares with a par value. This account also holds gains and losses from the issuance, repurchase, and cancellation of shares, as well as gains and losses from the sale of complex financial instruments.. Note that the additional paid in capital is only recorded at the initial public offering (IPO)Initial Public Offering (IPO)An Initial Public Offering (IPO) is the first sale of stocks issued by a company to the public. Prior to an IPO, a company is considered a private company, usually with a small number of investors (founders, friends, families, and business investors such as venture capitalists or angel investors). Learn what an IPO is because it is only dependent on the issue price of equity, not the market value. Once a company’s shares start trading on a public exchange, their price movements don’t impact the APIC account on the balance sheet.